Amazing Views From Boca Grande. This first floor 2-bed, 2-bath condo offers gorgeous Gulf front sunset views with stairs leading you right down to the seawall. 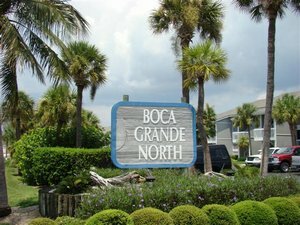 This Boca Grande North condo has been fully updated with hardwood floors throughout and high quality furnishings. Sip a glass of wine from your private screened porch overlooking the Gulf of Mexico. Boca Grande North is located on a small tropical barrier island surrounded by the blue waters of the Gulf of Mexico. Enjoy the many facilities offered at Boca Grande North in a beautiful tropical setting including: 58 lighted boat slips with electric service for crafts up to 40 feet; swimming pool with decking providing for wonderful sunbathing; whirlpool spa, barbecue grills; tennis courts; choice of golf courses within minutes and excellent shopping.